Are you a perfectionist? Has anyone ever referred to you as having a Type A personality? While being organized and having a leadership personality isn’t sin in and of itself, the enemy can use these otherwise honorable personality traits to wear us down, isolate us and cause us to be ineffective for the things of God. My health starts to waiver and I look to Dr. Google for diagnosis and treatment options. Our children struggle in school or act out and I start researching ways to improve my parenting techniques. The Holy Spirit convicted and reminded me that we are commanded to be faithful, not perfect! Why am I so quick to forget this area of His grace? Scripture shows us plainly that God has never looked for perfect people. He is simply looking for us to be faithful. Remember King David? Despite King David’s respectable traits, he wasn’t perfect. He committed sins involving not only adultery, but murder! It’s important to remind ourselves that we all fall short of perfection in everything we do (Romans 3:23). That’s why God sent His only Son to take our place as payment for sin (John 3:16). Instead of striving to be perfect, let us measure ourselves against the biblical standard of faithfulness. When we start to do this, we will see that everyone around us is in the same boat (1 Corinthians 10:13). We will be less likely to isolate ourselves and more prone to confess our sins to other believers (James 5:16). This will help hold us accountable to our brothers and sisters in Christ, and encourage community. When we do life with other believers, we are stronger than when we try and do life alone (Proverbs 27:17). So, as we go about our daily tasks this week, Lord, I pray you remind us to aim for the goal of being faithful when we fall short. Let us remember that only Jesus was perfect and in Christ, God promises to overflow us with His endless grace. Note: If this post tugged at your heart, I would highly recommend the work of Dr. Henry Cloud and Dr. John Townsend. This post is an adaption of a devotional I read in the NIV Life Journey Bible which they both co-authored. Great reminder. Enjoyed your post. Thank you. Oh yes, faithful not perfect. This hits home in a deep struggle spot. For so long I didn’t think I struggled with perfectionism because I often go for “good enough.” Yet God has been showing me that underneath a deep desire for approval from others is an expectation of self that is the pride of my flesh. So grate to visit from Grace and Truth. I am blessed by your honesty, Ginger. I can definitely relate. Pride is an ugly and yet cunning beast that I struggle with in this sense too. Thank you for visiting and sharing your thoughts! Yes, yes! Love it! 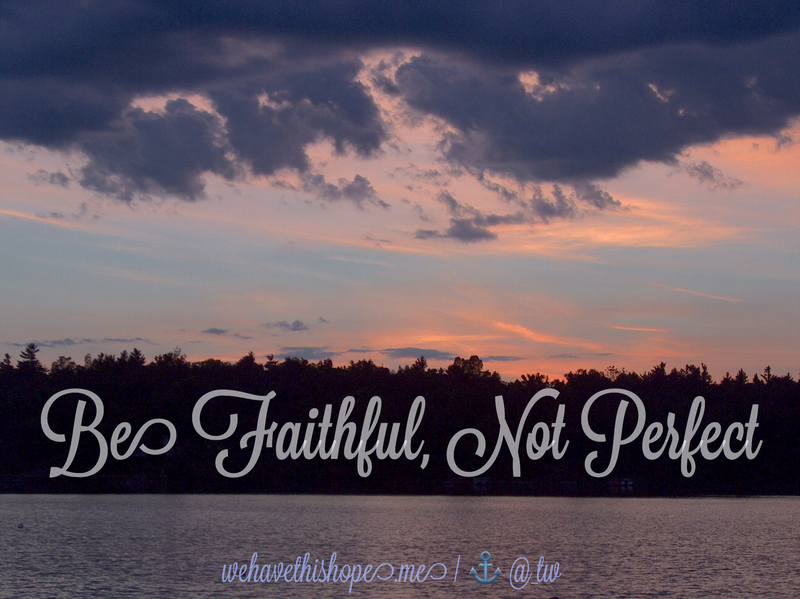 “Be faithful, not perfect” is an absolutely wonderful and beautiful phrase for what’s expected of us. 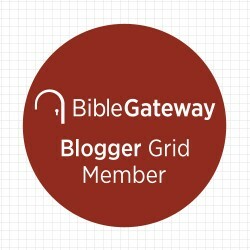 Thanks for linking up with Grace & Truth and I hope to see you back next week! It’s a phrase the Lord has continually brought me back to when the enemy attempts to fill my heart with doubts. Thank you for taking the time to read and share your thoughts, Jenn! I so appreciate this post, it’s a beautiful reminder! This is a message that needs to be heard by so many and I’m so thankful for it. I will be featuring this tomorrow for our next of Grace & Truth. Be sure to come by my blog tomorrow for an “Ive Been Featured” button! I am humbled and honored by this opportunity to share with others what the Lord has been putting on my heart. Thank you Holly; To God be the glory! Thank yo for that reminder. It is good to be reminded that we are called to be faithful. I need that as I deal with children and life. Blessed by your visit and comment, Beth. Thank you! Yes! I so completely need the Lord’s help to realize it’s ok that I am not perfect. Thank you for driving this point home – more and more – in my heart. I am blessed by you so often! Cheering your HEART! “Perfectionist in recovery.” I like that! Thanks for the encouragement, Abby. Yes…being faithful not perfect! Something I need to remind myself of daily! Thank you for these good thoughts to ponder on! Hi Rachel, thanks for stopping by. It seems as though there are many of us that can identify. Thank goodness for Christ’s finished work on the cross! Amen? I’m gonna keep that phrase “faithful not perfect” tucked away. Great and so very needed. Thanks Tina. Thank goodness for Jesus indeed! Because of His perfect works I am no longer exhausted trying to spin the plate of perfection. He declared, “It is finished,” so in Him I can find rest. Have a blessed Sunday, Ruth. Great reminder Tina! I know the enemy uses this area in my life to make me feel defeated at times. Faithful, not perfect. Great prayer! “Be faithful, not perfect” sounds like one of those things I can quickly say to myself when I notice I am going down the rabbit hole of perfection. I feel God asking me to be faithful in the small things, instead of trying to be perfect at all the big things. Thank you for your words. They really resonate with me, and I’m so grateful we were neighbors today on #RaRaLinkup! Amen to that Jenni! I find myself repeating the phrase as a breath prayer countless times a week. I’m blessed to know the topic God inspired me to write resonated with you. To Him be the glory! Be blessed.